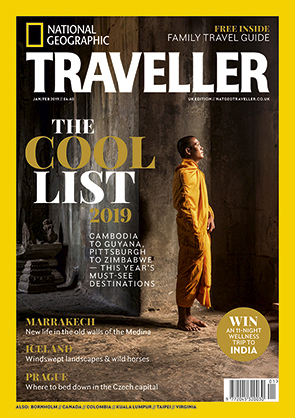 National Geographic Traveller (UK) has announced its Cool List 2019, highlighting the 19 must-see destinations for the year ahead. The hotly anticipated list of countries and cities is revealed in the Jan/Feb 2019 issue of the magazine — on sale on Thursday 6 December. Why now? Japan is to host the 2019 Rugby World Cup, and for those looking to avoid the crowds in Tokyo or Osaka, Japan’s Inland Sea is the ideal low-key getaway. Main attractions: England, Scotland and Ireland will all play at Kobe Misaki Stadium, and there’s plenty to do once the final whistle goes. Visit cities such as Hiroshima, or Matsuyama, or island-hop on the Inland Sea. Naoshima (Japan’s ‘art island’) has Chichu Art Museum, with works by Monet, James Turrell and Walter De Maria, as well as Yayoi Kusama’s polka-dot pumpkin sculptures. In 2019, it joins 12 other islands and two ports in hosting the Setouchi Triennale art festival. Main attractions: In 1819, William Smith sighted what became known as Livingston Island, part of the South Shetlands archipelago, just off the Antarctic mainland. And this year a replica of his tall ship, The Williams, will make the same journey. The Williams II, a refitted oak vessel constructed in 1914 that matches the dimensions of Smith’s craft, will make a voyage around Britain in spring, ahead of the Antarctic trip. You can apply to join the crew on one of its 10 week-long stages; no experience is necessary. Main attractions: While Pittsburgh is a blue-collar town at heart, it’s much more elegant than many visitors might expect. And there’s plenty for culture vultures, too. In 2019, the Heinz History Center plays host to an exhibition on the Apollo 11 Moon landings, while the Carnegie Museum of Art hosts the Carnegie International, the world’s oldest contemporary art exhibition, featuring the works of 30 artists from around the globe. The name most associated with Pittsburgh’s art scene, though, is local boy Andy Warhol, and the Warhol Museum features more than 8,000 works by the pop artist, plus an insight into his whirlwind life. Main attractions: The scenery, which shifts from white sandy beaches to soaring mountains, lush greenery and historic fortified towns. Explore single-track railways, swim beneath the 15th-century Citadel of Calvi, snack on figatelli sausages, or hike a stretch of the GR20 (a tough but beautiful 112-mile trail). Plus, with 2019 marking 250 years since the birth of Napoleon, it’s the perfect time to visit Maison Bonaparte, the emperor’s childhood home in Ajaccio. Why now? This year’s batch of new high-end hotels make Cambodia even harder to resist. Main attractions: Two new design-led, environmentally-aware island resorts are set to open: Alila Villas Koh Russey, a low-rise, modernist island escape spilling onto a private stretch of sands so soft it’s nigh-on impossible to leave footprints; and Six Senses Krabey Island, a secluded hideaway with seahorses bobbing in the water out front and Cambodian-inspired treatments in the spa. Alternatively, escape to the jungle for a stay at the recently opened Shinta Mani Wild, a luxury camp with tented suites perched above a river between three national parks. Main attractions: Making waves on the Kowloon waterfront is Victoria Dockside; the best place for a harbourside stroll, with sculpture parks, art galleries and tai chi gardens. The West Kowloon Cultural District, meanwhile, is home to a new Cantonese opera house, the Xiqu Centre, and later in 2019 will be the location of M+ — a museum set in an inverted ‘T’ of steel; exhibits will include works by Ai Weiwei. Back on Hong Kong Island, Tai Kwun, known as ‘the Big House’, is a former police station, prison and court that’s been converted into interactive galleries and some of the city’s hottest new bars and restaurants (try Old Bailey for divine dim sum). Why now? With Mugabe gone, Zimbabwe’s new president, Emmerson Mnangagwa, seems keen to invest in tourism. And while there’s been economic and political turbulence, the safety of tourists hasn’t come into question. Main attractions: Victoria Falls and the surrounding area have always enjoyed the lion’s share of the attention, and for good reason. As well as the beautiful falls themselves, the Zambezi flows through gorges and over rapids that are perfect for those after an adrenalin rush. And don’t miss Zambezi National Park, three miles away. Just 10 years ago, you’d have been lucky to see anything but a few impala here, but the local anti-poaching unit has made enormous strides and the species list now includes four of the Big Five (only the rhino is missing). Why now? More flight connections make reaching the country’s natural attractions even easier. Main attractions: Hardly anyone goes to Guyana. With only around 3,500 tourists per year, almost 20 times as many go to Antarctica. The former British colony is technically one of three Guyanas — alongside Suriname and French Guiana — but despite being English-speaking and having direct flights from Miami (to which American Airlines added an extra flight in December) and New York, it’s never established itself as a tourist destination. Guyana’s main prize is Kaieteur Falls. The largest single-drop waterfall in the world is a beauty, cutting its way through the jungle as the Potaro River falls 741ft before continuing towards the Atlantic. Why now? Oslo is the European Green Capital for 2019 — a sweet marriage of sightseeing and sustainability. Main attractions: Sure, you need to see The Scream, Vigeland Sculpture Park and Oslo’s stunning Viking ships. But pair all of that with a taste of the future at Fjord City, a waterfront reboot crammed with forward-thinking museums, art venues, parks, work and living spaces. Join Green Capital guided walks or community dinners at Losæter urban farm, or stay at the upcoming Clarion Hotel The Hub — Norway’s largest, with 810 rooms, opening in March. Main attractions: Eritrea is a former colony of Mussolini’s Italy and its capital, Asmara, is a treasure trove of mid-century modernist architecture, where espressos, mopeds and vintage Fiats are as common as mojitos and Cadillacs are in Havana. In 2017, UNESCO declared the entire city centre a World Heritage Site. Beyond Asmara, Eritrea has intriguing towns and wilderness regions to discover. The Red Sea is barely two hours away; from the port of Massawa you can visit the Dahlak Archipelago for superb diving. In July 2018, Ethiopian Airlines resumed its flights from Addis Ababa to Asmara for the first time in 20 years, meaning it’s now easy to visit both capitals in one trip. Why now? This Himalayan kingdom is considered one of the ‘happiest’ places on the planet and, in 2019, a swirl of swish yet sustainable resorts will open. Main attractions: Partly thanks to the fact it limits tourist numbers via an incredibly high tourist tax — up to $250 (£195) per person, per day — Bhutan has remained relatively insulated from the rest of the world. Ancient palaces and Buddhist monasteries cling to the sides of cliffs, tales of abominable snowmen, ghosts and angels abound, and that tourist tax goes towards infrastructure, education and healthcare for local people. In 2019 you’ll find half a dozen new resorts with a sustainable slant, including five mountain lodges from Six Senses, and what bills itself as the country's first dedicated wellness retreat, Bhutan Spirit Sanctuary, high in the Neyphug Valley. Why now? Being chosen as the only city outside of London to house a V&A Museum has created a new kind of swagger for Dundonians — and there’s more transformation to come. Main attractions: The £1bn redevelopment of the waterfront is still ongoing, but its crown jewel — the V&A, which opened in late-2018 — is in place. The project has also brought new restaurants, bars and a new railway station building to a part of town that had been in decline for decades. A few minutes’ walk away you’ll also find Robert Falcon Scott’s Antarctic exploration vessel, the RRS Discovery, which was built here in 1900. Main attractions: If you’re longing to see mountain gorillas in the wild, but Rwanda’s ultra-luxe lodges and high permit fees don’t suit your budget, head for Uganda’s Bwindi Impenetrable Forest instead. The steady growth of its gorilla population is one of Africa’s great conservation success stories, with tourists playing an important role. Almost 20 families can now be visited by guided groups of up to eight. Trekking fees raise funds not only for gorillas and their habitat, but also for Uganda’s other national assets including Queen Elizabeth and Murchison Falls National Parks, home to chimps, giraffes and hippos. Main attractions: The Sassi cave dwellings and churches carved into the mountains of this remote destination in Basilicata have made great locations for movie shoots over the years, but are still largely overlooked by tourists. More’s the pity. It’s a unique, atmospheric city where you can check into a hotel, dine in restaurants and visit artists’ workshops all set in ancient stone grottos that once housed some 15,000 people and their livestock, many of which lay abandoned for decades. Why now? This October, it’s 150 years since Alfred Russel Wallace’s book The Malay Archipelago was published — the perfect time to sail the region. Main attractions: Wallace’s answer to Darwin’s On the Origin of Species sets out pretty much all we now know about tropical flora and fauna and has never been out of print. Wallace spent 1854 to 1862 travelling the Malay Archipelago where he discovered the striking division in the distribution of animals that’s since become known as the Wallace Line: an invisible marker between Bali and Lombok running northward between Borneo and Sulawesi, either side of which the distinct fauna of Asia and Australasia are found. Several trips make the natural wonders of this region more accessible, including a new Dive Worldwide liveaboard experience tailored to snorkellers in the biodiverse Coral Triangle. Main attractions: Throughout the year there’ll be a programme of food festivals and events, markets and specialised tours focusing on the diversity of dishes from around Transylvania. However, Sibiu is worth visiting in its own right; a beautifully preserved 800-year-old walled city, it’s full of winding lanes, squares and grand churches, as well as the magnificent Brukenthal National Museum, which opened way back in 1817. Wizz Air offers easy access with direct flights to Sibiu from Luton. National Geographic Traveller (UK) has a cover price of £4.20, via subscription and on newsstands, and is published 10 times a year. Visit natgeotraveller.co.uk for more information.